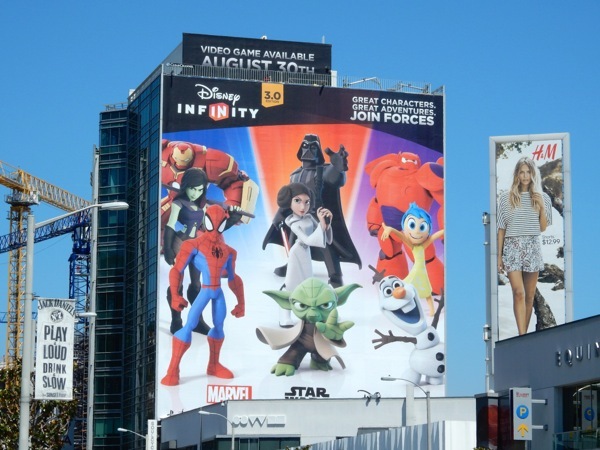 Did you ever imagine the day when you'd be able to enjoy all your favourite iconic sci-fi, comic book and animation characters in one game play experience? 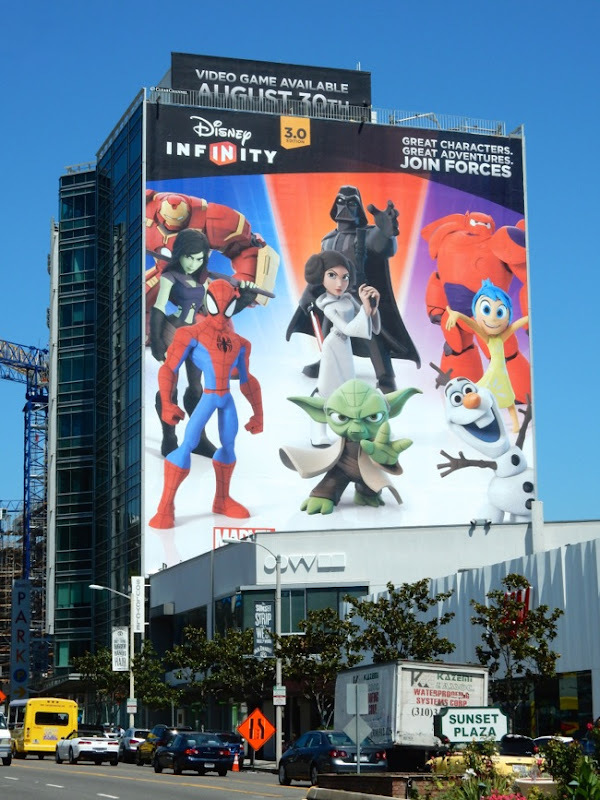 Well that day has come with the third generation of the Disney Infinity video game, which now comes with not only Disney, but also Marvel superheroes and Star Wars characters. The video game not only allows to you explore new worlds and adventures in your favourite universes, but it also comes with unique collectible figures. 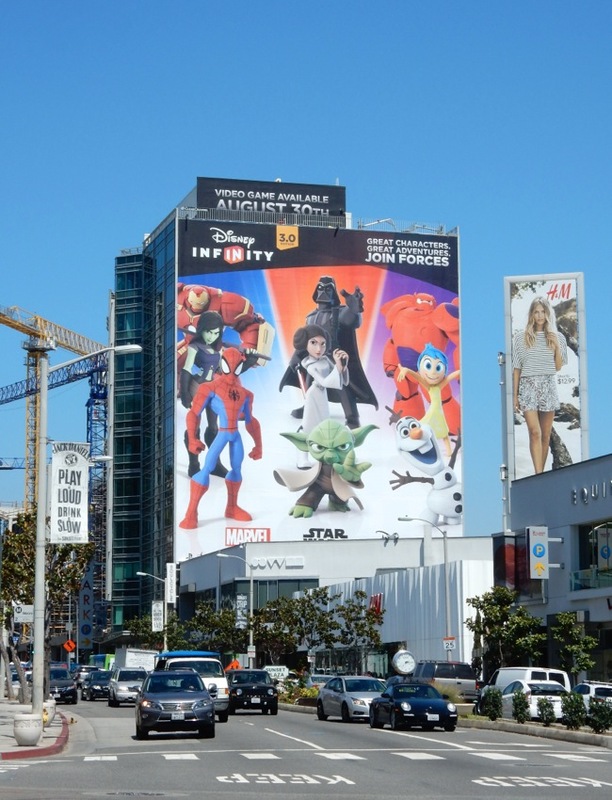 The giant-sized billboard for the 3.0 edition of Disney Infinity was photographed towering over L.A.'s Sunset Plaza on August 10, and clever showcases such fan favourites as Spider-man, Guardians of the Galaxy's 'Gamora' and 'Iron Man' in his Avengers: Age of Ultron 'Hulkbuster' suit, classic Star Wars characters 'Darth Vader', 'Princess Leia' and 'Yoda', plus newcomers like Frozen's 'Olaf the Snowman', Inside Out's 'Joy' and Big Hero 6's lovable 'Baymax'. 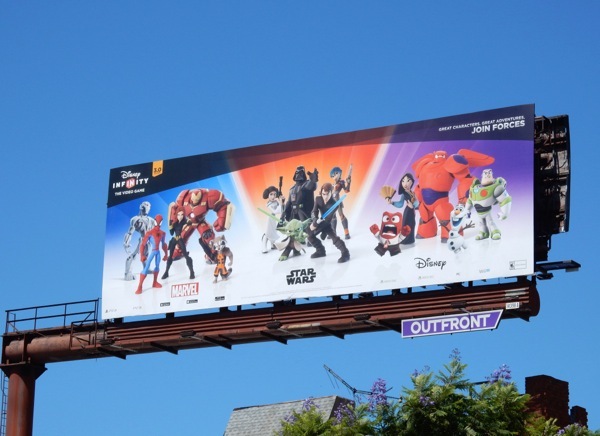 The standard landscape billboards snapped along Santa Monica Boulevard in West L.A. on August 8, 2015 feature a wider roster of recognizable heroes and villains, a nice selection of male and female characters, like 'Black Widow', 'Rocket Raccoon', 'Ultron', 'Mulan', 'Buzz Lightyear' and more besides. 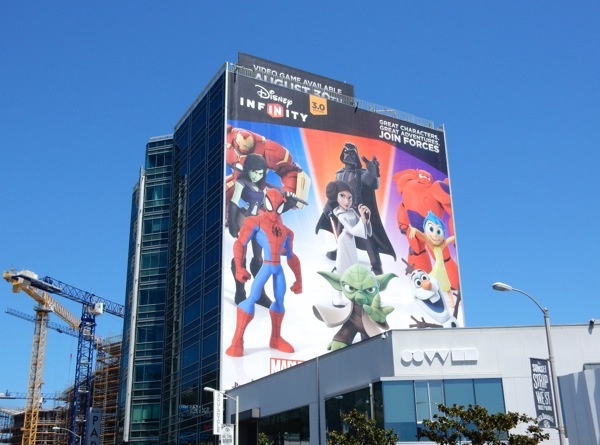 Fans of the console game should also check out these Disney Infinity launch billboards from August 2013. 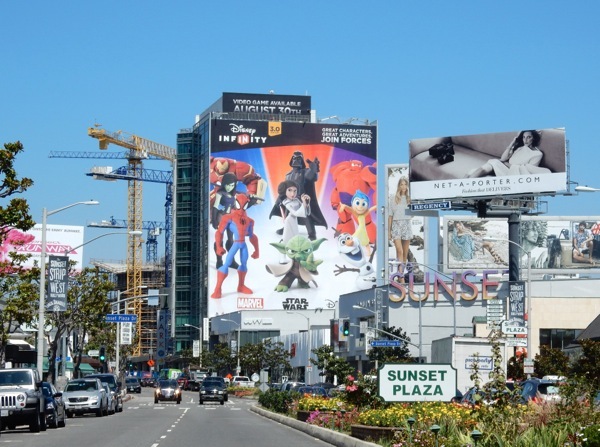 If you're a Marvel fan, be sure to check out all these other Marvel movie and TV show billboards. 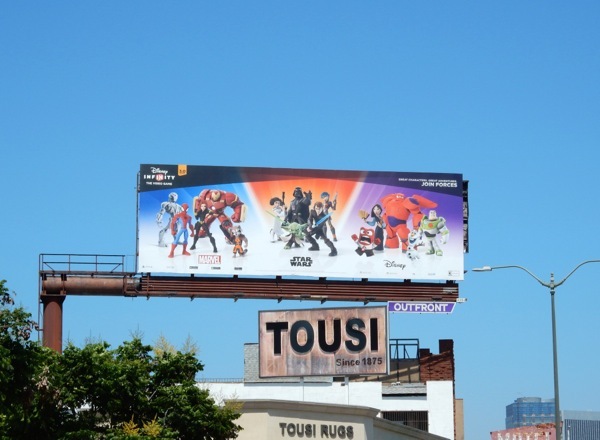 Plus if you're a Star Wars aficionado, be sure to also enjoy these Star Wars outdoor ad campaigns here at Daily Billboard. 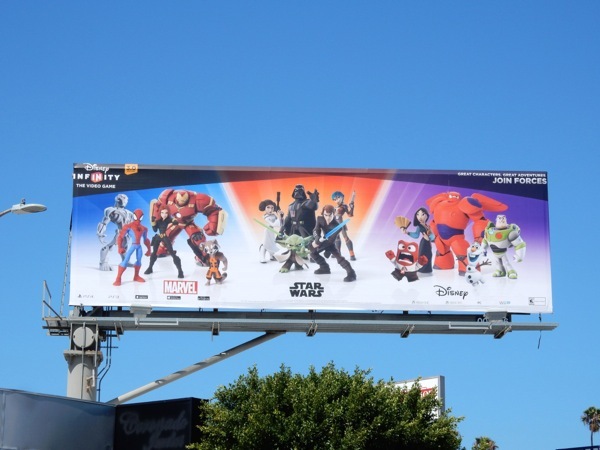 In the meantime, enjoy the variety and play on people, play on, to infinity and beyond. 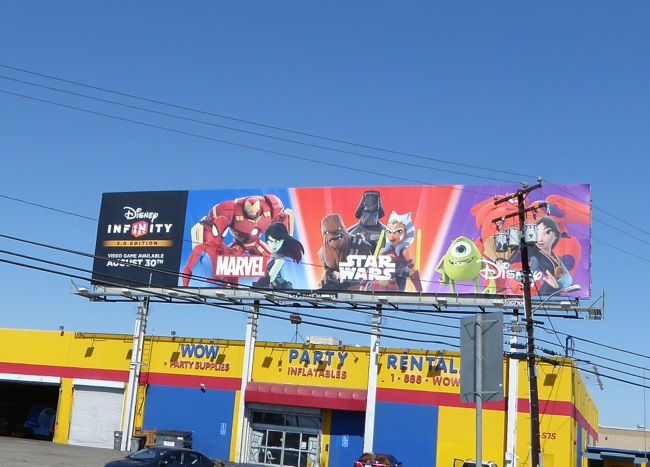 UPDATED: Here's another different billboard creative for the game snapped along the I-5 freeway on August 14, 2015. 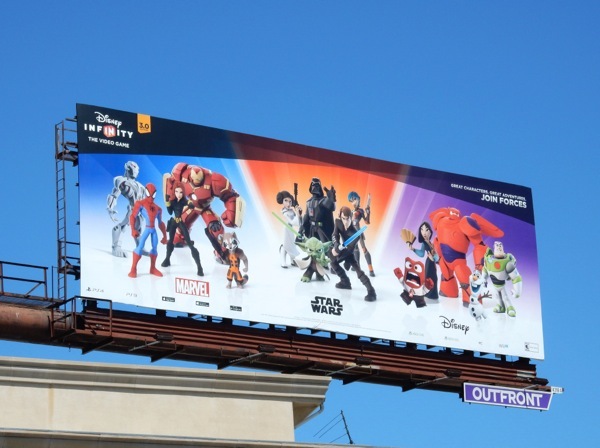 This one features everyone's favourite Wookie, 'Chewbacca', 'Ahsoka Tano' from Star Wars: The Clone Wars cartoon and also Monsters, Inc.'s 'Mike Wazowski'.